When I first heard about Twitter and took a look at what it had to offer I figured it wasn’t for me. My reasoning was that I don’t have internet access on my ancient phone (yes, yes, I know… I’m stuck in the past, but it helps to keep me sane), I don’t really see how anyone could realistically say anything interesting in a text message broadcast to the world (140 character maximum… just like a text message) and I have no interest whatsoever in knowing what my favourite moviestar/popstar etc had for breakfast. I was also put off by the thought of signing up as I have an aversion to giving away reams and reams of personal information that will no doubt be sold off to people who will simply bombard me with spam. I was wrong. You can access it from home on you PC or Mac in exactly the same way as you sign in to gain access to your emails. 140 characters is plenty of space to make an interesting point. As for signing up, the form you need to fill is the shortest I’ve ever seen (it takes less than 60s). 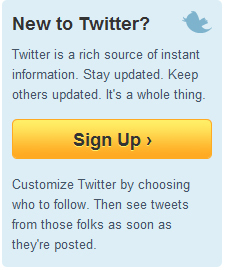 Furthermore, you have complete freedom to follow the Tweets of absolutely anyone that interests you (and only them). Finding and following them is as simple as typing in their name and clicking a button. When an epilepsy patient had electric current applied to the ‘nucleus accumbens’ (deep in the brain) they declared their love for the doc! A board game called “Ricochet Robots” is effectively a brain training tool that is not only great fun to play but improves spatial memory. There are more synapses (connections between brain cells) in your head than there are stars in our galaxy. Babies hear before they’re born-a sharp mum noticed that, during her 3rd trimester, the baby stopped kicking during the theme tune4Neighbours! In gelastic epilepsy the person’s fit primarily involves uncontrollable laughter. In one case a young patient won a “happy baby” contest! Candlelit dinners always make for a romantic date because the flickering light makes your pupils dilate telling your partner: you excite me! Babies’ senses are intermingled-we learn2separate them through experience. Synaesthesia(e.g. hearing colours)=incomplete sensory segregation. Colour doesn’t exist in the outside world. The brain actively creates colour based on relative strengths of different wavelengths of light. VOTE NOW: please leave a comment at the bottom of this blog to let me know which were your top 3 braintweets. This will help me to figure out which subjects stimulate the greatest interest so that I can try to provide more on the topics that you find most fascinating. 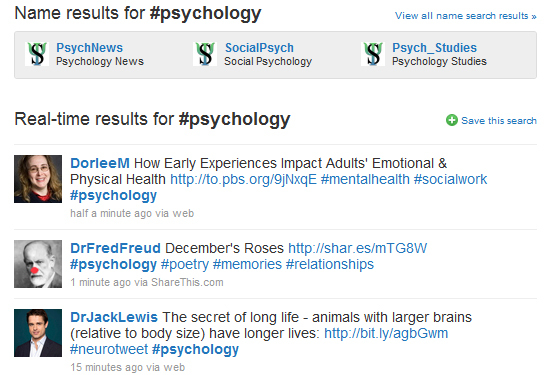 If you are curious about the “#” that precedes the keywords at the end of each tweet these are “hashtags”. Hashtags can be created by anybody to identify the theme of the tweet in the hope that others will start using it themselves. 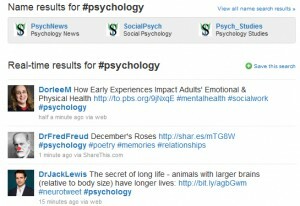 Hashtags allow tweets to be searched for by a common theme rather than just searching for individual keywords (which usually turn up lots of irrelevant tweets as well as those of interest). So if any of you out there stumble across a fascinating brain fact or new piece of research from the neurosciences then get onto twitter and remember to label your tweets with: #braintweet. You might also be wondering why the weblinks on tweets are so unusual. As Twitter only allows a maximum of 140 characters per Tweet it was essential that web addresses, which are often extremely long, could be abbreviated as much as possible. 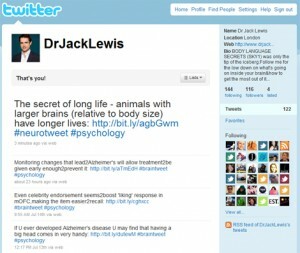 The following website offers this service: http://bit.ly/ You simply paste in the long version of the address, click on “shorten”, and it instantly provides you with a shorter link (which usually looks completely different) which can then be cut and pasted into your Tweet saving space for your words of wisdom. This allows Twitter to be used to share interesting websites and webarticles with your followers and anyone who happens to search for the keywords you have used in your Tweet. 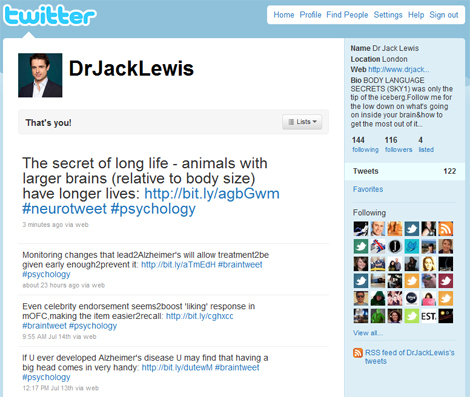 To follow me simply go to: www.twitter.com, sign in (or join), type: “DrJackLewis” into the search box in panel on the right, press enter. In the search results you should see my photo, next move the cursor arrow over my face. It will bring up a “rollover” box with a button in it that you can click allowing you to: “Follow” me – so that my tweets are fed straight to your account… enjoy!! Woh I like your posts, bookmarked! You have a really useful blog. I have been here reading for about 50 mins. I am a new and ur wisdom is very useful to me. This article is blue ribbon material as far as I’m concerned. I haven’t used my brain so much in years. This is very interesting content. Your material is great. I love to read intelligent articles and this is one reading I have really enjoyed. There’s no denying how much research you did for this content. What’s Happening i’m new to this, I stumbled upon this I’ve found It positively helpful and it has aided me out loads. I hope to contribute & aid other users like its helped me. Good job. Youre so cool! I dont suppose Ive learn anything like this before. So good to seek out any person with some unique thoughts on this subject. realy thank you for starting this up. this website is one thing that’s wanted on the net, somebody with a bit of originality. helpful job for bringing something new to the internet! I am a student and i found your info on the site really helpful for my study, Please maintain it up. We absolutely love your blog and find many of your post’s to be just what I’m looking for. Would you offer guest writers to write content for you? I wouldn’t mind composing a post or elaborating on a lot of the subjects you write related to here. Again, awesome web site! This is just what I have been searching for all day long. Don’t stop updating your blog. I have study a few of the posts on your web site today, and I really like your way of blogging. I tag it to my favorites site list and will be checking back soon. Pls visit my site as well and let me know your opinion. Excellent blog you have got here. You will see me going through your stuff often. Bookmarked! Random Google results can lead to wonderful blogs like this. You are performing a good job, and we share plenty of thoughts. You’ve got some seriously helpful information published here. Great job and keep posting good stuff. This is like my fourth time stopping over your site. I really love the content of your website. It must have taken you a lot of hours and effort. Keep writing. Your site was tweeted by a friend last night. Figured I’d check it out. Best decision ever. I like the stuff you put in here. Very relevant information. Consider yourself book marked. love your blog, http://www.yousaytoo.com/bernice/posts ,Thanks again…. Hi there, You’ve done an excellent job. I will certainly digg it and personally recommend to my friends. I am sure they’ll be benefited from this web site…. My husband and i ended up being excited when Raymond could deal with his preliminary research out of the ideas he had out of the site. It’s not at all simplistic just to continually be releasing methods that many others may have been making money from. And we fully understand we need the website owner to thank for this. The entire illustrations you have made, the straightforward website menu, the friendships you will help to create – it’s many superb, and it’s really making our son in addition to the family imagine that that subject matter is enjoyable, and that is really important. Thank you for everything! I was very happy to search out this web-site.I needed to thanks to your time for this excellent read!! I definitely enjoying each little little bit of it and I have you bookmarked to check out new stuff you weblog post. As a website owner I believe the subject matter here is reallyexcellent. I appreciate it for your time. You should keep it up forever! Best of luck.